Groupe Country Allemand formé en 1973 à Seevetal-Maschen, Germany et composé de Uwe Lost (né le 13 Juin 1949), Knut Bewersdorff (né le 27 Avril 1960), Cisco Berndt, Lucius Reichling (né le 8 Mars1947), Dirk Schlag (né le 21 Avril 1971) et Teddy Ibing (né le 10 Août 1948). 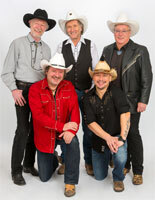 German Country group formed in 1973 in Seevetal-Maschen, Germany and consisting of Uwe Lost (born June 13, 1949), Knut Bewersdorff (born April 27, 1960), Cisco Berndt, Lucius Reichling (born 08.03.1947), Schlag Dirk (born on 4/21/1971 ) and Teddy Ibing (born August 10, 1948). When you think of country music, Germany isn't exactly the genre's leading spawning ground. 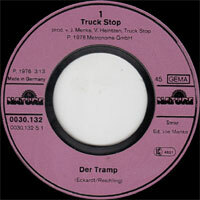 But Germany has birthed several country-based acts over the years, one of the most successful being Truck Stop. The sextet (comprised of gentlemen who go by such names as Prove Cisco, Lucius, Erich, Uwe, Teddy, and Knut) originally formed during the early '70s, and has issued albums steadily ever since. Their music/approach mirrors that of their U.S. counterparts, as evidenced by the titles of their albums (Keep on Trucking, Louisiana Ladies, Highway 59), and such hit singles as "The Wild, Wild West," "Take It Easy Old House," and "Arizona, Arizona." 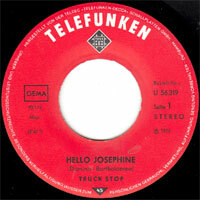 Although virtually unknown in the U.S., Truck Stop's fan base remains strong in Europe. 06/2008 CD GLORIELLA ? 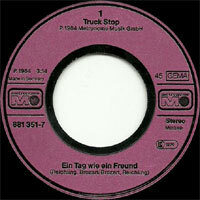 (GER) .